Barely an year and a half after the l998 general elections, the people of India are being forced to elect a new Lok Sabha. The responsibility for this lies squarely with the BJP. After the last general elections, the BJP-led alliance was nowhere near commanding a majority in the Lok Sabha. Inspite of this, the BJP opportunistically formed a government under its leadership. Right through its tenure, this government was poised precariously on the brink of collapse, because the BJP had put together a rag-tag coalition which even included parties which had fought the election against it. Finally, the inevitable happened. After 13 months of mind-boggling misrule, the government made an ignominious exit. Rule by the BJP at the Centre is fundamentally different than rule by any other party. The BJP is a party guided by the RSS. It believes in Hindutva, and is committed to dismantling the secular–democratic values of the Indian Republic. The l3-month stint of the Vajpayee government proves this conclusively. For the first time, the very basis of the secular principles enshrined in the Constitution stand threatened. The values which have become part of the common consciousness of the Indian people will be eroded if the BJP continues to be in Government. 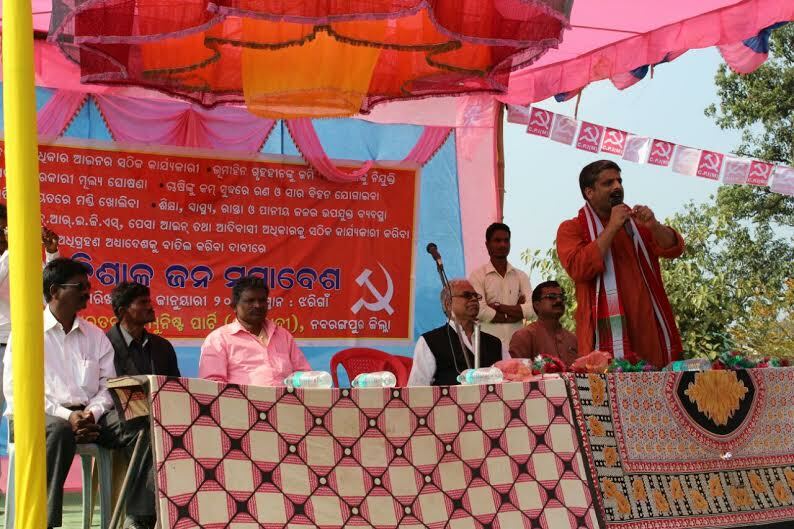 promoted the large-scale penetration of the administration by the RSS. The period saw the most widespread and systematic attack on the Christian community. At no time since independence has such a virulent and violent campaign of intimidation been launched against a small minority. The gruesome murder of Graham Staines and his two children epitomises the intolerance and hatred towards religious minorities. The BJP-led government wished to pursue its agenda of reviewing the Constitution. The aim of this agenda is to eliminate all the secular provisions, like Article 370 and Article 30, which guarantees the rights of minorities. Systematic efforts were made to subvert the secular nature of higher education by appointing pro-RSS personnel. Artists and intellectuals who opposed communal ideology and divisive politics were threatened and intimidated. Even though the BJP ran a rickety coalition government, it did not hesitate to resort to authoritarian measures. It used the draconian Article 356—not once, but twice—to dismiss the elected Bihar state government. It is only the firm stand taken by the President and the BJP’s failure to muster a majority in the Rajya Sabha, which foiled this brazen attack on democracy. The BJP leadership in government advocated a presidential form of government by doing away with the Parliamentary system. It planned to get this issue taken up in the review of the Constitution. It resorted to the cynical use of ordinances to bypass Parliament. The ordinance to amend Prasar Bharati was promulgated after bypassing the Rajya Sabha. It arbitrarily dismissed the Naval Chief of Staff, Admiral Bhagwat. After such an act, unprecedented in the history of independent India, the government refused to discuss the matter in the Parliament. The continuance of the BJP in government would mean ushering in an authoritarian system based on Hindutva. Soon after assuming power, the BJP abandoned whatever little pretensions of Swadeshi it claimed, and embarked on a shameless spree of wooing multinational corporations and opening up all sectors of the economy indiscriminately to foreign capital. Thanks to these policies, MNCs are taking over Indian companies and buying up the Indian partners' share in joint ventures. No previous government has attacked the public sector so vigorously. Privatisation is the watchword of the BJP. The party is hell-bent on selling public assets at scandalously low prices to big business and foreign companies. By asking profitable public sector units to buy back their own shares from the government and cross-purchase of shares by PSUs, serious damage was done to the major PSUs. The only budget that the BJP-led government presented for 1999–2000 gave concessions worth Rs. 8,000 crores to the corporate sector and the affluent sections. By dismantling the Public Distribution System to benefit private traders, the BJP has thrown the rural and urban poor at the mercy of black marketeers, hoarders and profiteers for buying essential commodities. The onion price rise scandal and the dropsy deaths due to mustard oil adulteration in Delhi under the BJP state government, typify this anti-people policy. The Vajpayee government launched an all-round attack against the ordinary people by big increases in the issue prices of rice, wheat and sugar in the Public Distribution System. One after another, the prices of all essential items -- railway fares, postal rates, petrol, diesel, cooking gas and urea -- were all hiked up. The BJP-led government has promoted the MNC exploitation of agriculture. Companies like Monsanto have been given a free run to exploit Indian farmers. By refusing to firmly renegotiate provisions under the WTO and giving in to the pressures to make harmful amendments to the Patent Law, the Vajpayee government has threatened the interests of farmers; American companies are patenting neem, karela, jamun and other indigenous plants; the common people will have no access to cheap medicines. Under the Export-Import Policy, over 1300 items were allowed free imports; such large-scale import liberalisation of a wide range of agricultural and industrial goods will spell ruin for the peasantry and domestic industries. Unlike previous governments, the BJP-led government refused to even consider the adoption of a Central legislation for agricultural workers to safeguard the minimum rights of the most oppressed sections in the rural areas. The Vajpayee government's record is one of shameless and servile catering to big business, MNCs and the affluent, while ruthlessly squeezing the poor by high prices of essential commodities, failure to generate employment opportunities, and allowing the landlord–trader nexus to fleece the poor peasants. The Vajpayee government has ended its regime with one of the biggest corruption scandals in independent India. It has brazenly gifted away thousands of crores of rupees to the big business, Indian and foreign telecom companies. By changing the existing policy for operators in the cellular and basic telephone services to benefit a few big companies, the BJP leadership has set a new record in receiving kickbacks by depriving the government of precious revenue. It removed its own Minister for Communications to accomplish this. Every authority under the Constitution to which this matter was referred—the President of India, the Election Commission and the Courts—has expressed serious reservations about it. Yet, under the leadership of the Prime Minister himself, the government has acted as the agent for big capitalists. That this is not the only scam the BJP government has perpetrated is illustrated by the revelations of the former Advisor to the Finance Minister, Mohan Guruswamy. He has exposed how favours to big business have been granted through unscrupulous corrupt practices at the highest levels. Major projects have been approved in the power, telecom, petroleum and other sectors which warrant a serious investigation to uncover the nexus between the MNCs, big business and the BJP government. All those guilty of corrupt practices must be brought to book. Within a short period, the BJP-led government has reversed the course of India's foreign policy whose foundations were based on non-alignment and independence in decision making. After the Pokhran tests, faced with international isolation, the Vajpayee government began succumbing to US pressures. In its anxiety to get acceptance as a nuclear weapon power, it conducted an eight-month long secret diplomacy through the Jaswant Singh–Strobe Talbott talks, unprecedented in India's diplomatic history. The shift to a pro-imperialist policy soon became evident. The Vajpayee government refused to condemn the US missile attacks on Sudan and Afghanistan. It was lukewarm in its criticism of the NATO aggression on Yugoslavia. It refuses to oppose the drive for US global hegemony. The Vajpayee government harmed the process of improving relations with China by the Prime Minister's letter to President Clinton citing China as a security threat. The Vajpayee government has isolated India in the non-aligned movement and in the international community by its shortsighted and wrong policies. By conducting the nuclear tests in Pokhran, the BJP-led government abandoned India's long-standing policy of developing nuclear technology without going in for weaponisation. Jingoistic positions were taken on the bomb. The Home Minister even linked India's nuclear weapon status to the resolution of the Kashmir dispute, thereby inviting the internationalisation of the Kashmir issue. Pakistan retaliated with its own tests and a nuclear arms race has been launched detrimental to the interests of the peoples of the two countries. After adopting an aggressive posture, the Vajpayee government soon retreated and succumbed to US pressures. It agreed to sign the CTBT. This unprecedented step could not be implemented because of the fall of the Vajpayee government. The United States is banking on the BJP to complete the act of betrayal of India's interests by signing the CTBT and making undisclosed commitments on the Fissile Material Cutoff Treaty. The Vajpayee government set up a National Security Council. Then it made a mockery of the NSC, with it having no role whatsoever during the Kargil conflict. The BJP-led government has compromised national security by interfering in the higher echelons of the armed forces. The dismissal of the Naval Chief of Staff is the most glaring illustration of this. Blinded by its own rhetoric of India becoming a big power and of security being enhanced with nuclear weapons, the Vajpayee government is directly responsible for the fiasco of not detecting the large-scale Pakistani intrusion in Kargil in time. Lulled into complacency by the Lahore bus trip of the Prime Minister, the Vajpayee government was caught unawares when the large-scale planned intrusion by the Pakistan armed forces was organised. It is now clear that the planning began late last year and the Kargil infiltration took place around the time Prime Minister Vajpayee visited Lahore. The early reports indicating the violation of the Line of Control were either ignored or not taken seriously in the anxiety to project the Lahore bus trip as a great achievement of the Prime Minister. The country had to pay a heavy price for this gross negligence. For over two months the Indian armed forces had to battle in difficult conditions to evict the intruders from the Indian side of the LoC. The heroic fight waged by the Indian jawans and officers has resulted in India defending its territorial integrity. This was achieved due to the bravery of the armed forces who worked in enormously difficult conditions in the icy heights to undo the damage caused by the unnoticed intrusion. Pakistan had planned this provocation to internationalise the Kashmir issue; it invoked intervention by the US and the Western powers by highlighting that both the countries involved in the conflict possessed nuclear weapons. Now Pakistan expects direct talks on Kashmir under US auspices. The Vajpayee government in its over-eagerness to get American support has willy-nilly provided the US the status of a mediator or facilitator. What Kargil highlights is the need to reverse the shortsighted positions taken by the Vajpayee government with regard to our security and foreign policy. What happened to the 8–9 per cent annual rate of growth of GDP? What happened to the promise of providing one crore jobs a year (ten crores in ten years)? What happened to the 20 lakh additional housing units annually? What happened to the 33 per cent reservation for women in Parliament and state legislatures? What happened to the Lok Pal Bill? Where are the promised electoral reforms and the National Judicial Commission? The record of the Vajpayee government is one of unscrupulous politicking; opportunist compromises with miniscule parties to remain in power; industrial recession and economic stagnation; generous handouts to Indian and foreign big business; relentless price-rise and growing unemployment; authoritarianism and RSS penetration in organs of the state; unprecedented attacks on minorities and harmful positions on foreign policy and national security. The strengthening of the democratic and federal system in our country requires a vibrant multi-party democracy. The CPI (M) rejects the contention that the choice for the people should be reduced to a BJP-led combination or a Congress alternative. The Congress party's basic policies do not provide a democratic alternative to the BJP. It still advocates economic policies initiated in 1991, which are against the interests of the toiling people of the country. The Congress party is bereft of the political and ideological will to rally all the secular and democratic forces to fight the menace of communalism. It has not shown any determination to stamp out corruption, which marked its earlier period of rule. On questions of economic policies, the BJP and the Congress have no basic differences. Whether it be privatisation and further liberalisation, opening up of insurance or the patents bill, the Congress does not offer any alternative to the disastrous performance of the BJP-led government. 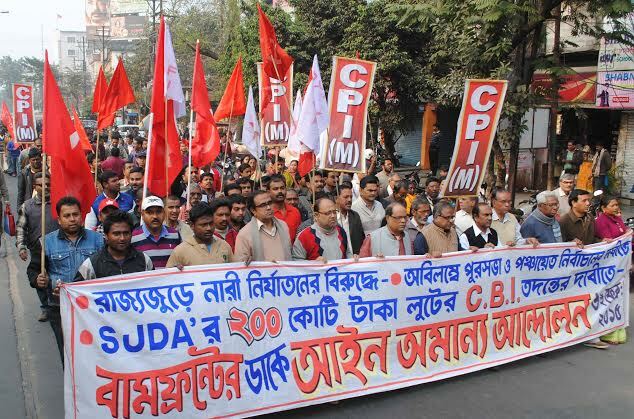 It is only the CPI (M) and the Left forces which have a consistent record in opposing the pro-big business-MNC policies and fighting for alternative policies. 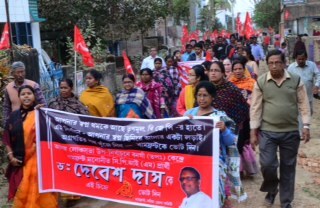 To strengthen the Left forces who are the firmest defenders of secularism and the interests of the working people, it is necessary that the CPI (M) and the Left succeed in registering big victories in West Bengal, Kerala and Tripura where the main contest is between the Left-led forces and the Congress/Trinamul Congress. 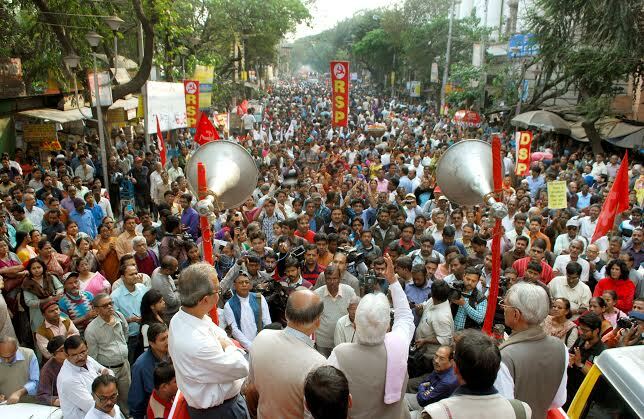 For the future of secular democracy, national unity and to advance the struggle for social and economic justice, it is essential that the CPI (M) and the Left parties come back with increased strength in the Lok Sabha. It is the effective intervention of the Left, which will enable all the democratic and secular forces to work for an effective third alternative. The Left parties have a consistent record of not compromising with communalism in any form. 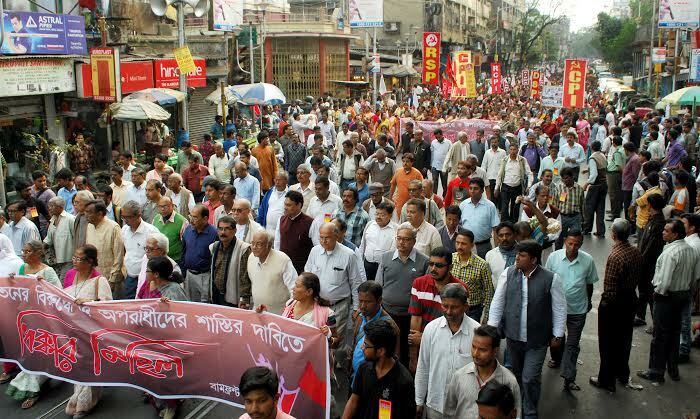 The Left parties stand for uniting all sections of the people in order to advance the struggle to bring in alternative policies opposed to liberalisation and communalism. 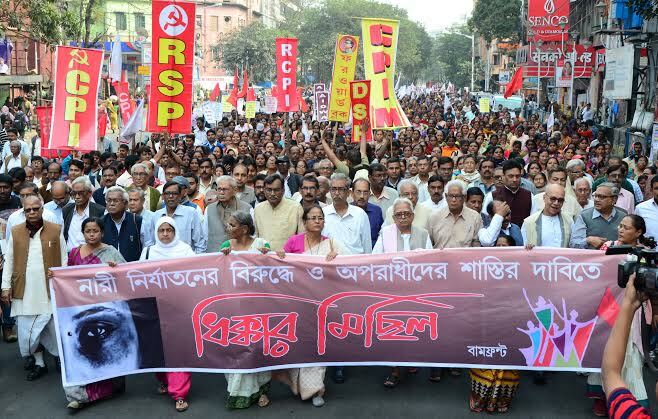 The record of the Left-led governments of West Bengal, Kerala and Tripura is a testimony to the progressive alternative that can be put in place if the Left and democratic forces are strengthened at the national level. Implementing land reforms, ensuring democratic functioning of the three-tier panchayat system, empowering the people with more democratic rights, defending secularism, maintaining communal amity and expanding the rights of the working people—these are all the gains made in the three Left-ruled states. These elections will put in place a government which will provide the direction for India on the threshold of the 21st century. The choice is clear: We have to decide whether we wish to strengthen India as a secular republic, a republic in which all citizens are treated equally in every sense, or whether we wish to plunge India into an abyss where sectarian religious hatred and discord becomes the norm. Defeat the BJP and its Allies. 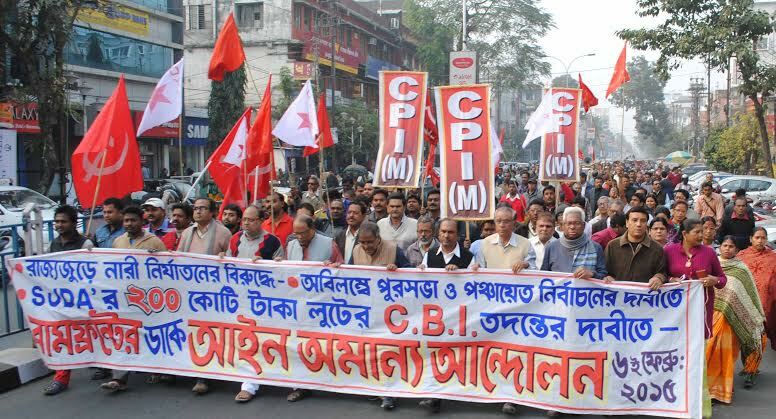 Strengthen the CPI(M) and Left. Support the Left, democratic and secular forces for a secular government. More than fifty years after independence, the policies pursued by successive governments in favour of the big capitalists and landlords have resulted in the all-round failure to solve the basic problems of the people. Despite the advances made due to the collective efforts of all sections of the people, growing disparities, hunger, unemployment, illiteracy and disease are the lot of millions of Indians. It is only the CPI(M) and the Left parties which address the basic issue of presenting alternative policies -- policies which can end social and economic inequalities. As India enters the 21st century, the struggle for a more democratic society, economic and social justice for all citizens and the strengthening of national unity requires a comprehensive alternative platform of policies. This will constitute the basis for a third alternative. 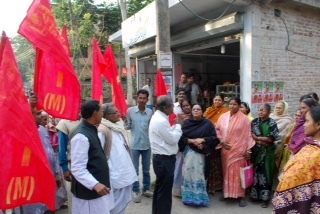 In the present elections, the CPI(M) wishes to advance the struggle for such a set of policies. Special steps to prosecute all those found guilty by the Sri Krishna Commission for the Mumbai riots of 1993. A resumption of dialogue with Pakistan on clear understanding that there will be no third party role; Emphasis on people-to-people relations between the two countries and maintain cultural and trade relations to create a proper atmosphere for defusing tensions and improving overall relations. Acceleration of steps to improve relations with neighbours and promote SAARC cooperation. Halting nuclear weaponisation; revert to nuclear policy of developing India's independent technological potential while not signing any international treaty which is discriminatory. Not signing CTBT; work for universal nuclear disarmament and a commitment by the nuclear weapon states for denuclearisation within a time frame. Giving moratorium on testing parliamentary sanction and opening talks with Pakistan for a denuclearised South Asian environment. Cancellation of the Indo–US military cooperation agreement which links up India with the US global strategy. Removal of nuclear weapons from the US military base in Diego Garcia in the Indian Ocean. Create a national security apparatus which will work within the framework of the parliamentary democratic system. The policies of liberalisation since 1991 have benefited the affluent 10 per cent of the upper strata while subjecting the rest to acute deprivation. The BJP-led government has pushed ahead with this disastrous policy which suits the interests of the IMF–World Bank driven globalisation and in the interests of the imperialist countries. 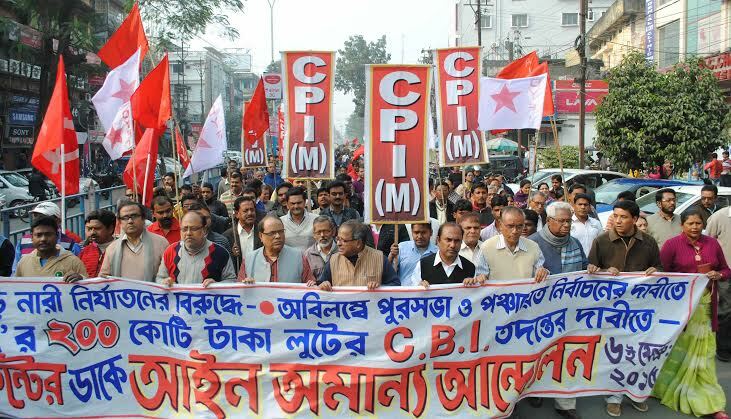 As against this, the CPI (M) sets out a comprehensive platform of economic policies. Take over and distribution of surplus land above the ceiling, handing over cultivable waste land to the landless, correction of land records, security for tenants and issuance of joint pattas for women. Prohibit sale of agricultural lands to foreign companies or their subsidiaries for agri-business. Increased public investment in agriculture. Ensure self-sufficiency in foodgrains production; remunerative prices for crops through market intervention by the state. Comprehensive insurance schemes for crop and cattle. Expansion of credit facilities for poor peasants and small farmers. Increased public investment in infrastructure; review of power and telecom policies in tune with interests of national development; adequate public outlays for power, communications, railways and road development. Strengthening of the public sector in the core and strategic areas by injecting fresh capital and technology. Foreign capital being solicited to in those areas for which clear-cut priorities are set. These priorities are to be determined by the need for developing new production capacities and acquiring new technology. Protection of domestic industry from indiscriminate lowering of import duties and takeover of existing Indian companies by foreign companies. Private sector to be encouraged to invest in new productive areas, R&D and the service sector like tourism. Encouragement to small scale industries with adequate incentives and sufficient credit from banks. Protection of traditional industries such as handloom, coir, etc. Yarn to be provided at control rates for the weavers and adequate facilities for the marketing of their goods. Ending the deployment of deep-sea fishing trawlers, protecting rights of the fishing community. During review of WTO Agreement in 1999, India should insist on critical review of the agreements made in the Uruguay Round; safeguard India's position with regard to TRIPS and oppose any multilateral agreement on investments; work for removal of WTO incompatible national legislations like Section 301 of US Trade Act. The insurance sector should remain in the public sector; LIC and GIC should be streamlined for greater efficiency; foreign companies should be barred entry into this sector; the trend of privatising the banking sector should be halted; reforms should be introduced to make banks accountable and restore social priorities; there should be proper regulation of non-banking finance companies to safeguard interests of depositors; capital flows should be regulated; no convertibility should be allowed on the capital account. Broaden the direct taxes base; instead of reducing taxes on the rich, raise the tax rates on the affluent sections (corporate tax, wealth tax, income tax, etc.) and ensure strict compliance; tax evasion should be firmly dealt with. Unearth black money kept inside and outside the country and tap it for productive purposes. Wasteful expenditure and the growing misuse of public money by officialdom and public servants should be stopped. 14 essential commodities should be included for supply in the PDS. A network of fair-price shops and cooperatives should cover all panchayats. Overhead costs should be curtailed, wastage and leakage from the FCI and distribution mechanism should be eliminated. Equal wages for equal work for women agricultural workers. The BJP-led government's policies intensified the industrial crisis leading to the closure of thousands of industrial units and loss of employment for lakhs of workers. The onslaught on the public sector, the decision to close down eight public sector units and the failure to revive potentially viable units have led to a crisis of employment. Side by side, undermining existing laws by allowing employers to violate labour laws have increased the exploitation of the workers. Revival of sick units, ending of disinvestment in public sector units, revival of sick public sector units by a suitable package of measures including reorienting the government policy on tax-concession, order-placement, credit, etc. in that direction; the revival of NTC mills, fertiliser units, IISCO, IDPL, etc. should be part of an overall thrust to rejuvenate the public sector and revive industries vitally important for self reliant growth. Workers' dues must get the priority over all other items while settling liabilities of any company/industrial units. Provision of need-based minimum wage for workers, revision of the statutory minimum wages in that direction with the provision of automatic linkage of the emoluments with price index. Rejuvenating the enforcement machinery of labour laws and social security legislations and suitable amendments in the laws to provide for stringent punishment for violation and expanding their coverage. Comprehensive legislations for the workers in the unorganised sector and home-based workers to govern their service condition, job-security, grievance-redressal and social security benefit. Recognition of trade unions through secret ballot and protection of trade union rights and right to collective bargaining by a truly representative forum. Effective scheme for workers' participation in management in both public and private sector. Removal/enhancement of obsolete ceilings in Payment of Bonus Act, Workmen's Compensation Act, Industrial Dispute Act and other legislations. Implementation of one-third reservation for women in legislatures is still pending. Overcoming opposition, the new Parliament will have to adopt this measure. Equal legal rights for women of all communities. Compulsory registration of marriage. Adoption of dowry eradication as a national mission. Equal property and inheritance rights for women and joint matrimonial property rights. Special schemes for female-headed households in rural areas and increasing employment opportunities for women. Legislation against domestic violence and sexual abuse of children. A comprehensive media policy to check the growing trend of commodification of women. Universalisation of child care services and an end to privatisation of anganwadis and other such social services. Abolition of child labour and enforcing rights of children subject to such exploitation. Introduction of compulsory primary education accompanied by free mid-day meals, provision of text books and other education materials. Free and universal education to be guaranteed for all children upto the age of 14 years. The 83rd Constitutional Amendment Bill, which lapsed, must be revived and adopted to make education a basic right for children upto the age of 14. Rapid expansion of primary school network. Upgradation of the salaries of elementary school teachers and providing schools equipped with minimum facilities. Syllabus and curriculum to inculcate secularism, progressive values, scientific temper and national unity. Allocation of 10 per cent of Union Budget for education. Support to mass literacy programmes. Democratisation of the higher education system and development of vocational education. Increasing the expenditure on public health to 5 per cent of the GDP. Provision of adequate network of primary health centres with sufficient stocks of medicines. Ensuring supply of essential drugs at prices affordable to the common people. Drug price control to be vigorously implemented to check price increases. Increasing the outlay on preventive medicine and eradication of diseases like malaria, tuberculosis, etc. There should be a National Water Policy. Provide for community/panchayat role in management of water resources. Exercise control on indiscriminate use of ground water. Drinking water is a problem in 2 lakh villages. Provision of potable drinking water to all villages must be a priority task. Housing to be accorded the status of a basic right; housing schemes for urban and rural poor to be stepped up. Guarantee right to work as a fundamental right. Provide food-for-work programme to generate employment. Ensure adequate credit for self-employment schemes for educated unemployed, artisans and handicapped persons. Scrap freeze in recruitment in the Government sector. Grant of pension to working people as a third benefit; one-rank one-pension for ex-servicemen; remove 33 years conditionality for drawing pension of 50 per cent of salary for non-commissioned ranks; upgrading pensions of all categories of pensioners in consonance with the cost of living. Stringent action against untouchability and atrocities against scheduled castes and scheduled tribes and invoking of the provisions of the Prevention of Atrocities Act for this purpose. Ensuring that quotas for reservation for scheduled castes and tribes are filled up. Reservation to be extended to dalit Christians. Protect land rights of adivasis and restore land alienated from them illegally. Ensure the right of access to forests and forest produce; the Forest Act be amended for this purpose. Regional autonomy should be provided for tribal compact areas wherever necessary. Foster the development of the languages and culture of adivasis. Santhali should be accorded national language status in the Eighth schedule of the Constitution. Equal rights and opportunities for all citizens, irrespective of religion or caste are essential for a secular-democratic society. The Muslim community and some other minorities suffer from various forms of deprivation and discrimination. Special measures are required to remove their social and economic backwardness. While doing so, the CPI(M) appeals to the minorities to abjure fundamentalism and join the common endeavour to struggle for a just society. Protection of the just rights of the minorities; implement provisions of the Constitution to prevent discrimination. Special schemes for promoting educational facilities for deprived minorities; Provision for equal opportunities for employment. Protection and encouragement of Urdu language. A national youth policy must be adopted which comprehensively deals with issues of special concern to youth. The State should provide for an adequate network of sports and cultural facilities for youth in all parts of the country. The State should provide facilities for development of secular and democratic culture. The diverse cultural traditions of the people must find free expression and equal treatment by the State. All national languages listed in the Eighth Schedule of the Constitution should be equally encouraged and developed. The Prasar Bharati Corporation must be strengthened so that it becomes a genuine public broadcasting service. There has to be legislation to prevent growth of monopolies in the print and electronic media which is inherently undemocratic. No foreign ownership of print media. Enforce a media code for satellite broadcasters. Ensure that states have a say in media policy and programmes in the public broadcasting service. In promoting self-reliance, it is essential that a science and technology policy be adopted which provides for development of scientific institutions and development of substantial R&D potential in India. Strong R&D base by public funded R&D through CSIR laboratories etc. Formulate an environment policy which is integrated with the needs of rapid and sustainable development. Strict control must be exercised against industries using hazardous technology which affects the health of workers and the neighbourhood. Stringent action should be taken against contractors illegally cutting down forests. There has to be a uniform national rehabilitation policy for persons displaced by development projects. Develop mass-transit and public transport system to curb vehicular pollution. Amendment of Section 77 of the Representation of People's Act to plug loopholes in enforcing ceiling on election expenditure by bringing all election expenses including those by parties and friends in the candidate’s expenditure. Proportional representation with partial list system. Effective steps to prohibit persons with criminal background from contesting elections. State funding in the form of material for recognised political parties based on the Indrajit Gupta Committee Report. Amendment of the Anti-Defection Law so that any elected representative who leaves the party has to vacate the seat forthwith. Steps to curb corruption at all levels, particularly those holding high public office. Lok Pal Act should be adopted which will provide for investigation and binding recommendation of prosecution of public servants upto the level of Prime Minister. Provide for CBI and other investigating agencies getting functional autonomy to investigate cases leading upto prosecution. The system of governance should be made more accountable for which citizens must have the right to information for which a Right to Information Act must be passed. Constituting a National Judicial Commission for appointment of judges of High Courts and Supreme Court. Reforms in judicial system to provide speedy relief at affordable cost to the common people and to heighten accountability. There should be a proper balance in the relations between the legislature, judiciary and the executive and the exercise of powers in their respective spheres without encroaching into the legitimate domain of the other organs.